Time for a little rant. 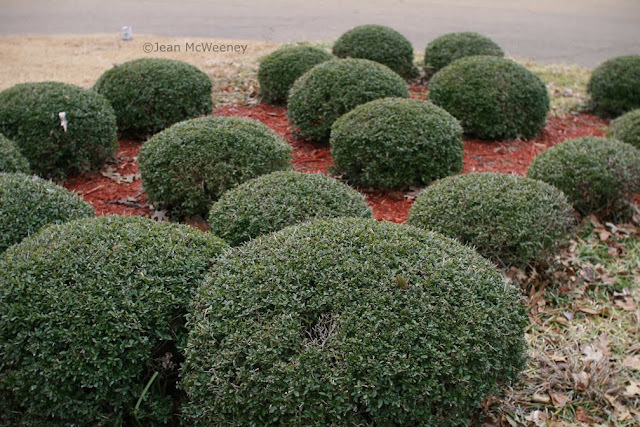 What is it about corporate America's fascination with bushes that look like gumdrops or meatballs? This time of year exposes all that is weak in a landscape. Driving around my town, which has lots of banks for some reason, I just couldn't look at another crappy bank landscape without deciding to blog about it. Look at the bushes above. Can't you just tell they're dying to break out of their squat little molds? At least they didn't submit the Crape Myrtle to whacking. These holly bushes above look like they're trying to hide their beautiful berries. I did manage to find one bank landscape that hadn't screwed things up...yet. The landscape above is for a new bank. Dward Yaupon Hollies, Indian Hawthorns, Crape Myrtle, and some type of taller hollies. Yes, it's the same-old, same-old when it comes to plant variety but at least they're letting them grow normally. Just down the street from the above photo was a fast food joint. 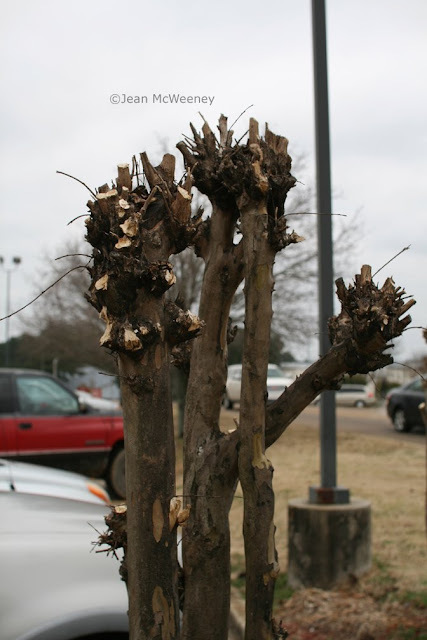 Check out what they've done to their crape myrtles. I ask you, is that pretty? Another public landscape with whacked crape myrtles (can anyone tell me definitely if it's spelled "crape" or "crepe"?). Below is a close up of the wounded tree. So here's what I want to know - is it the corporations who want their landscapes to look so artificial or is it the fault of the landscapers themselves, the ones who should know better? Do you see this in your town? I went to my mom's house tonight and was horrified to see she pruned her huge front yard crape myrtles - so unnecessary! I love when Felder Rushing calls unnaturally round shrubs meatballs! They certainly abound in commercial plantings around here. In a lot of residential plantings as well. I guess it's safe to say that most financial institutions get a grade of F in both how they run their businesses and in their landscaping choices. 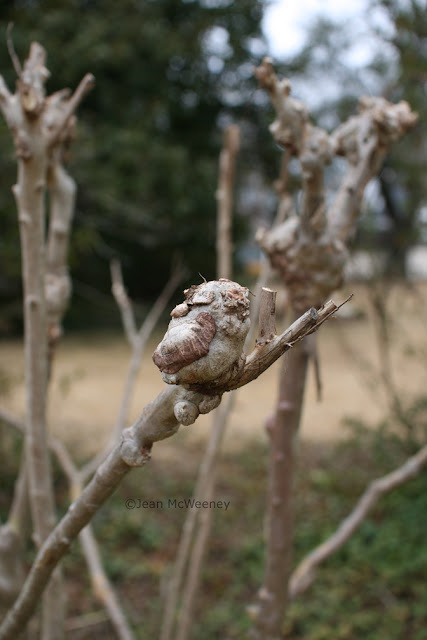 Sad about the crape myrtles, but it looks similar to how we prune our redtwig dogwoods. We hack them down to the ground in hopes they won't come back in the spring, but they always do....and look better and better every year. I think it's the landscapers' fault--they have to have something to do, to show that they've earned their money, right? If you leave it "natural" the bank might not think you've done any work. As a designer who works with a design/build/maintenance firm, I'm appalled to see such butchering passing for pruning. 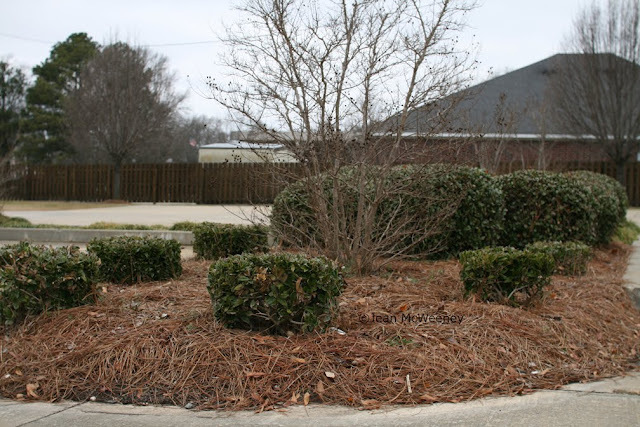 First off, no one should prune crape myrtles until spring (and I hate meatballed shrubs unless they are boxwoods that have been planted with that look in mind). We prune crape myrtles in March or April and never like this, although in some cases we inherit clients whose crapes have been butchered like this in the past and we try to cope with them as best we can. Pollarding (Google it) is an old approach to cutting back crape myrtles that produces very large blooms but once you start it you can't stop. Donna, your red twig dogwood will give you more intensely red branches if you cut it back hard every year. I have an 'Ivory Halo' cultivar that isn't that vigorous but every year I take out some of the old canes to keep new ones coming that are a deep red. Great for the winter landscape. Donna, I almost think cutting the crape myrtles to the ground would be better than what they do here. At least we wouldn't see these painful looking trees. Susan - I do blame the landscapers but I've seen so many bad practices here that I'm starting to think they don't know any better either! But I agree that there's a lot of justification going on, and thus the various atrocities they commit. Melissa - I'd love to visit your blog but your Blogger profile is not enabled to allow access. You're right about once the crape myrtles have been hacked, you really can't fix them. Ack! Those poor crepe myrtles, (I have no idea which spelling is correct, or if both are acceptable). I really think it is the landscape, or maintainance outfit that does the pruning that way. The owners just want it to look *neat*, not messy, you know like nature. The actual workers don't have to be trained to make a gum drop, just part of the mow, blow and go set. Heavy on loud machines, light on artistry. Only if people complain will something change. The young plantings may be in for the same treatment when they get larger. The look is what many expect from commercial buildings, and even private residences. Anything out of the norm is reason to call the City and complain, sadly. They need to be reeducated. Yes, I so agree with you about meatball shrubs. In particular I like landscaping for birds and that style provides nothing for birds. Not to mention offending my artistic sensibility. Congratulations on your writing, that you mentioned in your comment on my blog today. I do love crape myrtles and cannot, of course, grow them here in New England so it is interesting to hear this discussion. Every region has its' landscape traditions, good and bad. I do think people like what they see and just don't know any better. Landscapers sometimes have to do what they are told and sometimes they don't know any better. Love that red mulch....NOT. Oh yes, we see this around here, too--and we have a bank on every corner, it seems. I think Frances is right that businesses want a "neat" landscape; I also have my doubts that many of those who maintain these plantings really know what they're doing. Last year, my son's landlord hired someone to trim all the shrubs around their house--you should have seen the results! 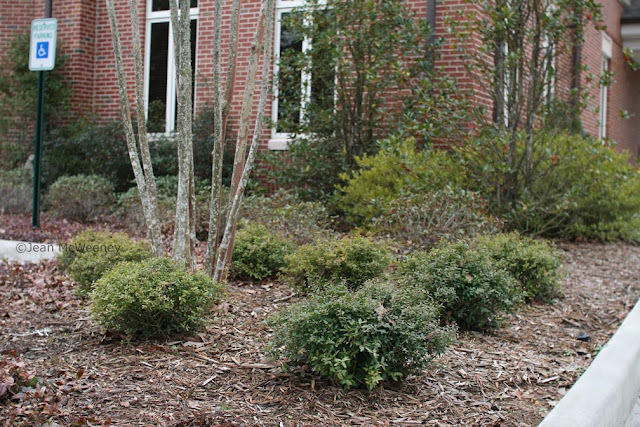 Their yews looked like the crape myrtles you've shown here; I don't know if they'll ever recover. 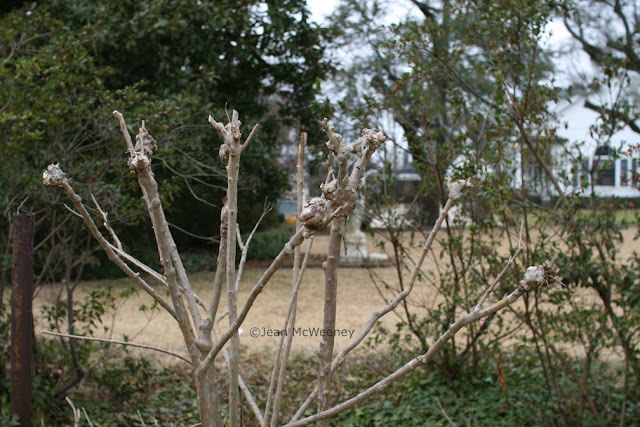 I can't grow crape myrtles here, but I drool over them on Southern bloggers' posts--these poor things look pathetic! I absolutely see that type of terrible "landscaping" around here! I agree it is so frustrating, and I wish I knew who to blame for it! That is my pet peeve...I was just ranting about it today! Why can;t they just leave the poor plants alone to do their thing! Gardeners everywhere unite! All of those things are familiar sights, sadly. I'm really not sure of the correct spelling but I am sure that the pruning jobs you show are INcorrect! Crape murder is a common practice and it pains me to see those poor knobby branches. Jean, I must confess... I do have a Linden tree that was put in a holding bed and never moved!!!! So now it is a topiary... though I love it this way it should be out in the open growing to about 60 feet! I have seen this kind of severe pruning in Europe. Severe pruning such as you showed will eventually weaken or kill the plant. To answer Rose's question, evergreens, especially yews, rarely recover from it. And Rose, my dear, there is now a crepe myrtle that is hardy for the Chicago area. Most major garden centers, such as Gethsemane, carry it. 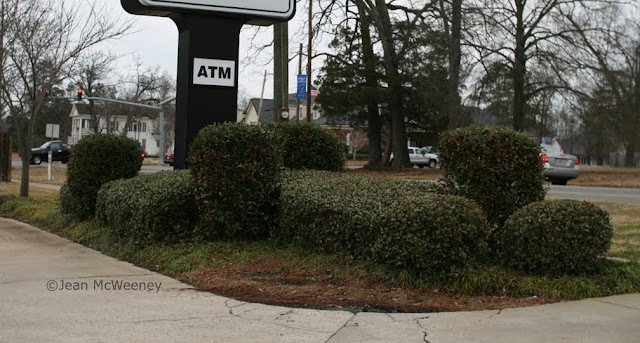 I think it is a combination of the landscapers, and the owner's outdated opinion of what shrubs should look like. We have junipers here that always are trimmed into boxes, both around homes and offices. The newer buildings though have gone away from such ugly trimming. Great Rant, Jean! Much like comically over-sheared poodles get made fun of by REAL dogs, I bet the other bushes make fun of the meatball shrubs. You don't have a poodle, do you? Did I just offend your dog? I love learning something new like how to spell crapemyrtle - thanks Dee! Here, in Austin, Texas, this happens because the big landscaping crews (mow & blow guys) appear to have no knowledge about what they are doing. Many of the crew are not from the U.S. and speak little English. I know because I have had two such landscaping companies in my neigborhood, and I see their workers coming & going on a daily basis. I also have a friend who does landscaping and she hires them as well. Several summers ago, I went out to eat with colleagues and as we pulled out of the parking lot, I witnessed the mow & blow crew installing a bed of begonias in the garden strip alongside the street entrance to the restaurant. They were pulling out the earthworms (no kidding) and dumping them on the hot summer pavement. I couldn't believe it. Oh owie. It hurts just looking at these poor guys... It's hard convincing folks to pay us a decent wage to do landscape maintenance because I think they assume we're going to do THAT. We have to carefully show people what garden maintenance should look like.